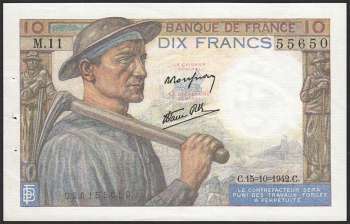 Common name among French collectors: "Mineur". Signatures of P. Rousseau and R. Favre-Gilly. 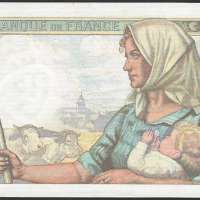 To the best of my understanding, issue date is one of the major factors that determine the price of a French banknote, since the issue quantities for some issue date(s) are much less than the others, and hence even though two banknotes are of the same type and condition, their price may differ by 10 times or more if one of those has a rare issue date. In my French banknote collection, I have got three 10 France (Mineur), all in NEUF (UNC) condition and rare issue dates (two 11-9-1941 and one 19-4-1945), I bought them from various auctions, one of them cost me $264 and others two are around $170 each, which is closed to the reference price (€160) quoted in the Claude FAYETTE reference book. I hope that you will find the above information useful. fought in D Day and the Battle of the Bulge.